The nitric oxide (NO) molecule is quite reactive and unstable. In ambient air, it reacts with oxygen to form the toxic nitrogen dioxide (NO2). Where does Nitrogen Oxide come from? Nitrogen oxide is mainly an unwanted by-product of fuel combustion at high temperatures. Cars and power plants are the main sources of nitrogen oxide. What are the effects of Nitrogen Oxide? Nitrogen oxide causes a multitude of symptoms, primarily in the lungs but also in other organs such as the spleen and liver. Additionally, nitrogen oxide is jointly responsible for acidification and over-fertilisation of soil and water. Gaseous nitrogen oxide may become particulate ammonium nitrate. This contributes to large-scale PM (PM2.5, PM10) pollution. During the summer, nitrogen oxide and hydrocarbons cause formation of ground-level ozone and destruction of the ozone layer. 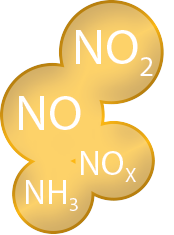 Nitric oxide in sample gas reacts with ozone to form nitrogen dioxide. This reaction results in electrically excited molecules. These molecules release their excess energy by emitting photons, which are measured by a photomultiplier tube. The airpointer NOX module is equipped with a delay loop to measure NO and NO2 from the same sample. Zero air supply is part of the standard equipment so that a zero point check may be carried out automatically (e.g. daily). An internal NO2 source for a regular span point check is available as an option. 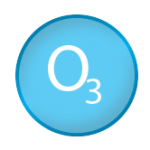 Ozone is formed in the atmosphere by reaction of nitrogen oxides, hydrocarbons, and sunlight. Ozone protects us in higher air layers (stratosphere) from harmful UV radiation. At ground level, higher ozone concentrations form only by other pollutants (ozone precursor chemicals) and sunlight. Nitrogen oxides and volatile organic compounds are the main precursors. Furthermore, methane and carbon monoxide (CO) contribute to the global formation of ozone. Insolation promotes the formation of ozone. High ozone concentrations thus occur mostly at midday and in the afternoon. Major sources of ozone are the chemical processes caused by industry and traffic as well as electrical current of television sets, computers, photocopiers, and electric motors (using brushes). What are the Effects of Ozone? Ozone causes above all respiratory ailments such as respiratory syndromes, changes in pulmonary function, increased respiratory sensitivity, and inflammation of the respiratory tract. Ozone additionally destroys the foliage of trees and other plants (photooxidation), thus aggravating the environment. A beam from a high-energy UV lamp is directed through a tube filled with sample gas. Absorption effected by ozone is measured with a detector at the end of the tube. Zero air supply is part of the standard equipment, so that a zero point check may be carried out automatically (e.g. daily). An internal ozone generator for a regular span point check is available as an option. Sulfur dioxide (SO2) is an acid-forming, colorless, foul-smelling and toxic gas. Where does Sulfur Dioxide come from? 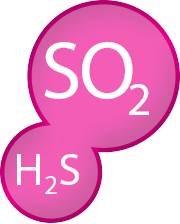 SO2 mainly comes from burning coal and heavy fuel oil. Major sources are firing systems in energy business, in industry, and small-scale heating systems that use poor quality sulfurous oil or coal. What are the Effects of Sulfur Dioxid? Sulfur dioxide may cause humans to suffer from headaches, nausea, reductions in pulmonary volume, increases in breathing resistance, and symptoms such as wheezing, chest tightness, and shortness of breath. Sulfur dioxide is one of the major „acid rain“ precursors which compromises ecological systems such as forests and lakes as well as it accelerates corrosion of buildings and monuments. Sulfur dioxide may reduce visibility as part of smog. Furthermore, particulate sulfate adds to large-scale PM (PM2.5, PM10) pollution. Sample gas is lighted with an UV lamp, which causes the SO2 molecule to absorb energy. The absorbed energy is emitted as a light pulse (photon) which is measured with a photo multiplier. Internal SO2 sources for a regular span point check are available as an option. Hydrogen sulfide (H2S) is a highly toxic and corrosive, nauseously smelling gas. Where does Hydrogen sulfide (H2S) come from? What are the Effects of Hydrogen Sulfide? H2S destroys the body’s own hemoglobin and paralyses oxygen transport in blood. When it comes in contact with mucous membrane, it converts to form alkaline sulfides and causes eye, nose, throat and lung irritations. Its high acidity makes H2S a corrosive gas and may cause damage to electronic components. SO2 is scrubbed from the sample gas. H2S is thermally converted to SO2 and measured by UV fluorescence. Equipped with an H2S module the airpointer measures only H2S or only SO2 or both cycling with a minimum switching time of five minutes. Zero air supply is part of the standard equipment, so a zero point check may be carried out automatically (e.g. daily). Carbon monoxide (CO) is an extremely toxic gas resulting from incomplete combustion of carbon and carbonaceous products. Carbon monoxide is mainly a product of incomplete combustion of fuel and propellants. Major sources are traffic, industry and smoking indoors. 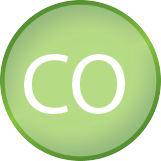 CO as pollutant is especially significant because of its toxic effect to humans (damaging hemoglobin). Furthermore CO plays a significant role for photochemical generation of ground-level ozone on a global scale. A certain concentration may reduce the amount of oxygen received by a person’s brain. The person may lose conscience or suffer permanent brain damage caused by lack of oxygen. Carbon monoxide may also contribute towards global warming. An infrared source beam is directed through a chamber filled with sample gas. Carbon monoxide absorbs this light. A photo-detector measures the emanating decrease. A „CO scrubber“ (catalytic converter) removes CO from the sample, so a zero point check may be performed automatically (e.g. daily). An internal CO source for a regular span point check is available as an option. Apart from the already installed modules the airpointer offers capabilities for implementing additional sensors and external instruments using the high performance airpointer data recording. These sensors are integrated via Ethernet, RS-232 or analog interfaces. Additional sensors are mounted outside or inside the airpointer depending on the space available. The airpointer continuously manages and controls measurement data via a web based user interface. The high-performance airpointer features can be used for each additionally implemented sensor. This includes data recording over a period of several years, data backup and faster data access via the recordum portal, data download for local analyses and more. PM10 and PM2.5 are not single components but the mass concentration of all ambient air particles with an aerodynamic diameter smaller than 10 µm (PM10) or 2.5 µm (PM2.5). Thresholds of these pollutants are frequently exceeded, especially in areas with strong vehicle traffic air pollution. This leads to an increased public awareness of PM issues. Particulate matter comes from diesel exhaust particles, tire wear, brake dust, and swirling road dust generated by vehicle traffic. PM2.5 and PM10 have a short-term effect on the cardiovascular system. Evidence of a direct relation between the number of heart attacks and PM concentration has been substantiated. For instance, a long-term effect of PM pollution is the potential to carry and hold toxic compounds in the respiratory system. Particles in lungs and bronchia weaken the immune system. The airpointer PM module uses nephelometry, the proven optical method of measurement. A sample heater minimizes the effects of humidity. The module uses a light-scattering photometer with a near-IR LED, a silicon detector hybrid preamplifier and a reference detector. The scattered light is proportional to PM concentration. The airpointer +PM can be equipped with an approved PM analyzer. Furthermore, you may connect the airpointer to an external PM analyzer by using the available interfaces. Thus you may as well use the airpointer’s advantages especially within data recording and data transfer for measuring PM. Beta ray attenuation is a radiometric measurement. The particles are deposited on a filter belt and exposed to beta radiation. Varying beta absorption during sampling defines the mass of the deposited particles. Benzene is a clear, colorless, highly flammable and volatile, liquid aromatic hydrocarbon with a gasoline-like odor. Benzene is found in ambient air as a result of burning fuels, such as coal, petrol and wood. Toluene also known as methylbenzene, is a clear, water-insoluble liquid with the typical smell of paint thinners. It is an aromatic hydrocarbon that is widely used as an industrial feedstock and as a solvent. Ethylbenzene is an organic compound, it is a highly flammable, colorless liquid with an odor similar to that of gasoline. This monocyclic aromatic hydrocarbon is important in the petrochemical industry as an intermediate in the production of styrene, the precursor to polystyrene, a common plastic material. Xylene is the term used to describe the three isomers of dimethyl benzene; m-xylene, p-xylene and o-xylene. Xylenes are produced mainly as part of the BTX aromatics (benzene, toluene, and xylenes). 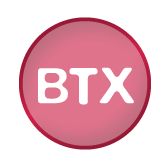 What are the effects of BTX? Besides the well-known carcinogenicity of benzene, also the hepatotoxicity, geno toxicity that are risks for human health caused by benzene.